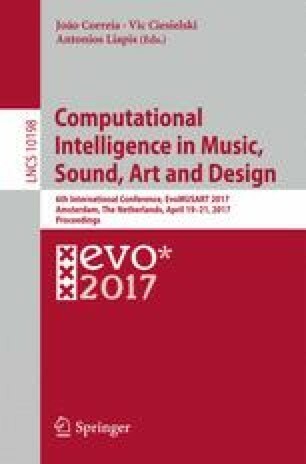 It has been demonstrated that computational evolution can be utilised in the creation of aesthetic analogies between two artistic domains by the use of mapping expressions. When given an artistic input these mapping expressions can be used to guide the generation of content in a separate domain. For example, a piece of music can be used to create an analogous visual display. In this paper we examine the implementation and performance of such a system. We explore the practical implementation of real-time evaluation of evolved mapping expressions, possible musical input and visual output approaches, and the challenges faced therein. We also present the results of an exploratory study testing the hypothesis that an evolved mapping expression between the measurable attributes of musical and visual harmony will produce an improved aesthetic experience compared to a random mapping expression. Expressions of various fitness values were used and the participants were surveyed on their enjoyment, interest, and fatigue. The results of this study indicate that further work is necessary to produce a strong aesthetic response. Finally, we present possible approaches to improve the performance and artistic merit of the system.